Growing up a Cubs fan, my idea of a beautiful baseball stadium was Wrigley Field. 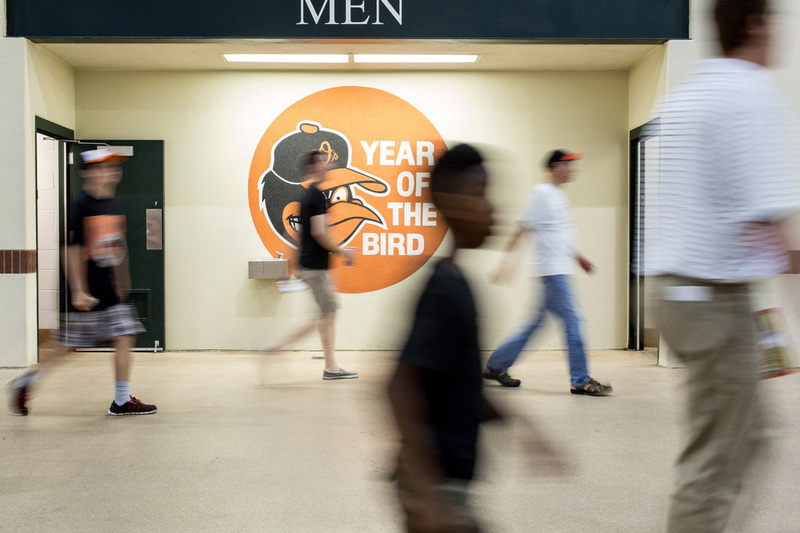 With a retro warehouse, green-painted steel beams, brick arches and old-school streets passing through the stadium, Oriole Park at Camden Yards shares quite a few similarities with Wrigley. The retro architecture and atmosphere at Camden make it one of my favorite stadiums. The retro ballpark design began in Baltimore and has been copied many times in the past 22 years to the point it has become cliché and "more derivative than it already was" as Reeves Wiedeman at The New Yorker puts it. While I can somewhat identify with such an assessment, Camden largely stands above the claims of being cliché and derivative because it was the trendsetter, the leader of the movement. The Oriole offense was largely absent against the Rangers until the sixth inning when they scored three to tie the game at four. The Orioles scored another two in the following frame and a trio of Orioles relievers shut down the Rangers offense for a combined 3.1 innings. The game was delayed by rain for 98 minutes and it gave me my first opportunity in this project to document how people reacted to the delay. I had a blast and met some great fans. Fans enter on Eutaw street before the game. Former Orioles first baseman John Wesley "Boog" Powell, right, shares a light moment with Kenny Murell near Powell's barbecue restaurant in the outfield concourse. Those in both bullpens stand for the National Anthem. BJ got Rangers pitcher Ben Rowen to sign a ball. Social worker Joy Aisha Bell laughs with Joann Wilson, who was attending her first baseball game ever. From left, Kevin and Mike watch the game in the bleachers. Clarence “Fancy Clancy” Haskett gives a fan a free coozie. He has been vending for 40 years. "After 40 years you done got close with a lot of people," he said. "And it's not just here at the ballpark." Over the years he said he's been to Oriole fans' weddings. From left, Linda Sprenkle, Marcia Talley, Joseph and Thomas cheer during a pitching change. Gregory hands out baseball cards to fans he interacts with as an usher. Members of the Orioles field crew pull the tarp over the infield during a rain storm. John Turpin and his four-year-old son Dylan sit in the bleachers during the rain delay.